Since the official ground-breaking ceremony in April 2018, preparations for the construction of the world’s most advanced special steel plant in Kapfenberg/AT have been progressing rapidly. Nabaltec AG/DE once again reported revenue growth in the first half of 2018, with revenues climbing 3,5 % to a record high of EUR 91,8 million, up from EUR 88,7 million the year before. Second-quarter revenues were up 3,1% from the same period of last year, to EUR 46,5 million (up from EUR 45,1 million). 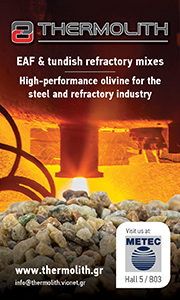 On 12 December 2018 the 9th Freiberg Refractory Forum will be held at the Alte Mensa in Freiberg/DE. RHI Magnesita/DE has announced the proposed merger of its 3 Indian subsidiaries RHI India, RHI Clasil into Orient Refractories. Event Partners/GB is launching at Telford International Exhibition Centre (near Birmingham/GB) on 10–11 July 2019 a new show. The 20th conference on modern refractory materials and key achievements in high temperature technologies will take place in Prague/CZ from 24–26 April 2019 (Venue: Czech Association of Technical Societies, Novotneho lavka 5). 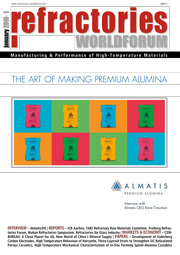 As demand for tabular alumina expands with India’s refractory requirements, Almatis is committed to support and enhance its customers’ success with quality alumina products and excellent service. JSW Cement, one of India’s leading producers of green cement and part of the USD 13 billion JSW Group, will invest nearly USD 150 million in Fujairah/UAE.